Though the extraordinarily warm weather of this month seems to be behind us, and more typically cooler weather has returned, winter is definitely no longer on my mind. Spring has supplanted winter in actuality and in my head. 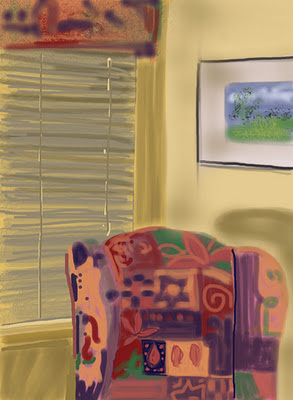 This iPad digital work was provoked by a visit to the main campus of the college where I teach. It is located in the woods of the forest preserves of Cook County. The forest is mostly oak forest. The leaves are slower to emerge on these oak trees than the other trees that are now almost completely leafed-out. The forest floor is covered in new green foliage that was stunning to see. It is a mist of greens in varying stages of yellow to yellow green. With the top canopy largely absent, the sun shown through to the ground to foster this explosion of growth. It was magical and beautiful. This cannot begin to capture it. Photography can’t capture it either. The experience of it can never be reproduced after the fact. I can try to capture the feel of it but never the experience. Oh, well! I did this while in Florida also. I had been thinking about it for some time. I had been coming home from Wisconsin and it had snowed lightly the night before. It was just enough to fill the low spots between furrows of the freshly plowed fields. There was no green to be seen. There was only the subtle beauty of winter neutrals and their slight shifts in temperature. The stripes of the fields caught my eye instantly. I am such a sucker for stripes! The undulation of these stripes just hit my happy spot! The weather has finally returned to a more typical 50℉ range. It raining and very gray outside. We need the rain as we are short on precipitation with the lack of snow. So a couple days of rain will replenish our water table. I think the title describes this very well. It was done from my memory of a small stand of trees seen from the car. There was a large stand of trees behind them and a large cumulo-nimbus cloud in the sky. 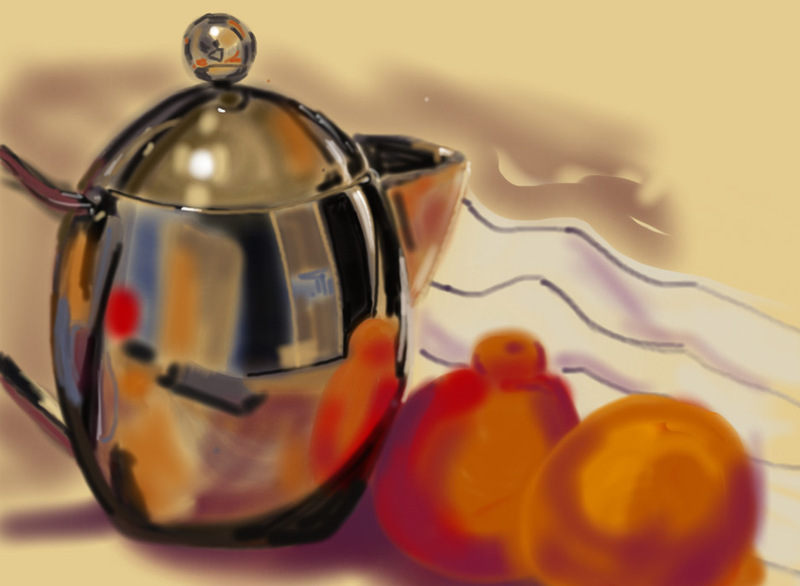 This iPad drawing precedes the drawing of the previous post. 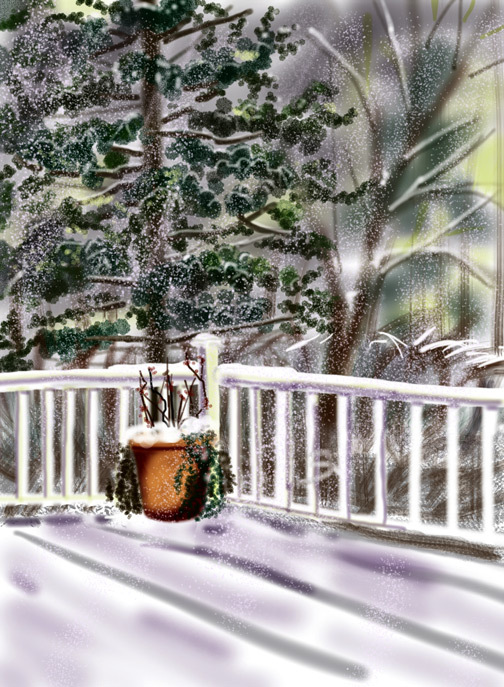 That stand of trees was right outside our door so I could refer to it while I drew. I saw this only briefly. My memory of it at the time was fuzzy. So I made a lot of stuff up. The app I use has the feature of layers. I can create nearly as many layers as I want. I still have a hard time thinking about them while doing the drawings. To me, the iPad is just like a piece of paper and I draw in it that way. The layers can be a real boon to the execution of the drawing. I can draw my way out of the thing by going from background layers to foreground layers. That is, if I remember to add a layer and the remember which layer I am drawing on. I have been using a computer for graphic design for 20 years. (I can’t believe it’s that long! Am I a geeza!) Even so I never really learned the drawing programs that well. By the time I was done farting around trying to draw on the computer, I could have drawn the thing 10 times and been long done with the image, had it scanned, and placed in the document. So now the iPad is forcing me to catch up. Using the apps on the iPad is much simpler and they are easier to learn. That simplicity makes this digital realm no different than any other drawing material. I think that is why I am enjoying working with it. But I still have to make an effort to think about the layers. I have just returned home from a spring break visiting friends in Florida. The whole time my hubby and I were gone it was 75—80℉ in Chicago. (It was the same in where we stayed.) To say that’s extraordinary is an understatement! Temperatures usually hover in the 40℉ territory at this time of year. Chicago has had the warmest winter in my memory. No sub-zero temperatures. What snow we had was slush soup or melted in days. Our February had many 50℉ days. It’s been a flabbergast! Go figure! I came home to forsythia in bloom. My honeysuckle and flowering crab are well into the process of producing leaves. This is 5-6 weeks premature. I only hope a sudden frost will not take its toll on the products of this bizarre weather. Having said all that, my little Florida, pine tree iPad painting/drawing seems an anti-climax. The area of northern Florida we visited is known for pine tree farms used for paper pulping. These pines were not available to the paper mills by being in a residential area. They are very tall and thin trunked. They shed their lower branches as they grow so all the needled branches are in the tops of the trees. I have more of these and some low-tech paintings/drawings to post so visit again soon. I am a magpie of a sort. I like shiny things. I love working with highly reflective surfaces. It’s a fascinating process translating what I see to the flat drawing support. The iPad is very suitable for the task. 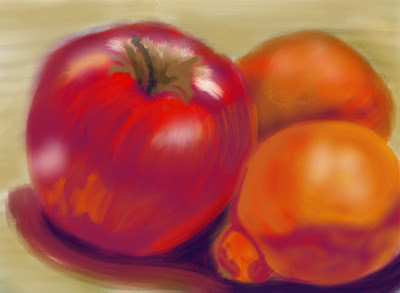 I can select brushes with soft edges and adjust the degree of opacity which makes it the perfect tool. But, I am still very much a traditional materials girl. I get lost in the process and forget about the layers which can be manipulated. There are no layers like this with canvas and paint. This is another attempt at iPad painting. I am really enjoying it. The color is so intense especially with the luminosity of the iPad. 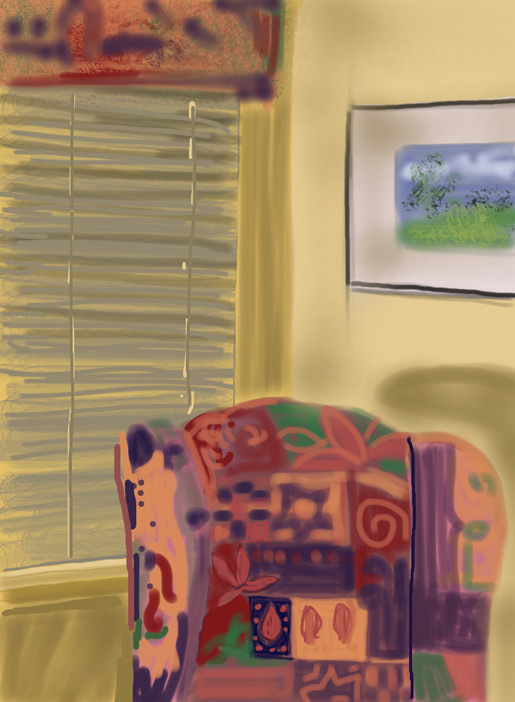 I understand why David Hockney insists on exhibiting his iPad paintings on the device itself. The luminosity would be lost otherwise. Sharing these on the internet also preserves that though some monitors can render these rather garishly. This is a favorite subject matter of mine. It is not necessarily the the actual objects that are the favorites. It’s the polished surface. I really like painting them. It’s a lot of fun. 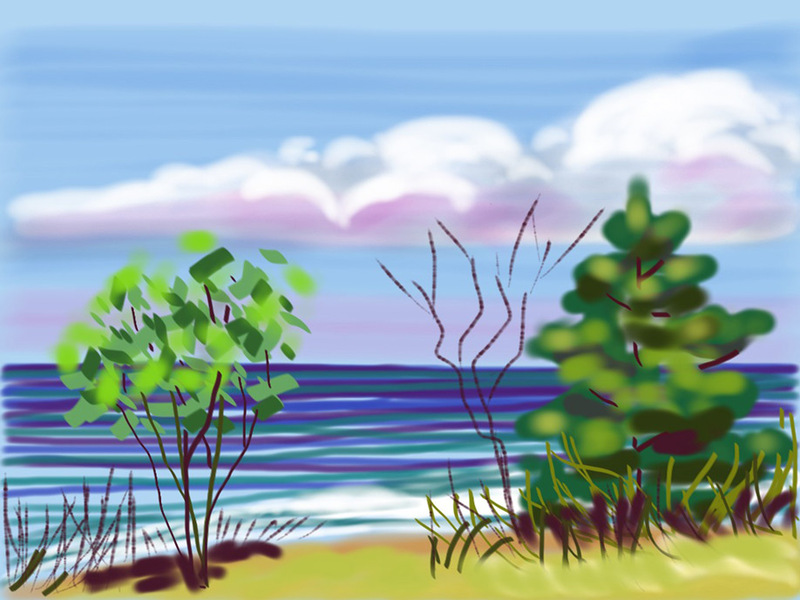 Painting with the iPad is a lot of fun too. I recommend it. It’s more fun than game apps. I only have one of those and that’s enough for me. This one the first iPad paintings I did with my iPad. I have been switching back and forth between two different apps. I still have not decided which app I like the best. Both have their advantages. It’s easier to save and share images with one than the other. But it is not as easy to change brush attributes on the fly. So I am still making my assessment. I know I will gravitate to one or the other and use it exclusively. It’s just too difficult switching once the software becomes familiar. Another iPad practice piece. It’s back to basics in learning to use the iPad app. Spherical fruit fill the bill. I still have to use the layers more effectively. Right now they have elements that are spread out over several layers when they should be placed in a more discreet manner. Practice on! After all my kvetching yesterday that the iPad still felt mediated to me and I needed more practice, here is more practice. Sometimes I do do stuff that requires deleting and starting again but I am getting more accustomed to the methods of working with layers. Today is a good day for such things as we have a winter storm warning. Since I have no reason to go outside, it is best to stay indoors today. This is the view out my patio window onto my deck. 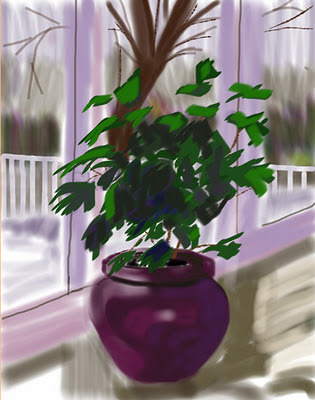 A star of my summertime paintings with its now dead plants are enduring the winter until spring rolls around. Then a new batch of plants will take up residence for another summer. Hopes for spring are eternal. I am continuing my play with my iPad. I made this as I usually do with a watercolor. It comes directly out of all the visits to Door County to paint with a group from my college. This is a reflection of what I saw when I awoke every day and fell out of bed right onto the beach! Not hard to take is it? It’s so ingrained in my memory, I can make all kinds of variation on this theme. It’s a lot of fun.